Trail snowmobiles are most commonly known as “entry level,” providing the best design for snowmobilers new to the sport. Their lower-powered engines and lighter weight make them easier to ride and handle when navigating trails. The can be equipped with electric start and reverse features to ease starting and maneuvering. Trail snowmobiles also come with a relatively lower price tag in comparison to other snowmobile types. Best-selling trail snowmobile models include: Arctic Cat Snopro and Arctic Cat Z 570; Polaris Super Sport Base, Polaris 340 and Indy Deluxe; and The Ski-Doo Grand Touring and Expedition models. This type of snowmobile is heavier than other model types, features a higher horsepower engine, advanced suspension systems and recommended for expert, experienced riders. And, while comfort isn’t their strong suit, performance snowmobiles are built for aggressive, performance-oriented riders. Check out the Polaris Edge X600, Arctic Cat ZRT or the Yamaha VMax 600 when shopping online for used performance snowmobiles. Featuring a two-person seating configuration that integrates a backrest, touring snowmobiles are heavier than trail snowmobiles. They feature side-mount rear view mirrors and cater to riders who prefer luxury amenities, such as heated seats, and communication systems. Touring snowmobiles are also longer, wider and heavier than trail or performance models. Popular touring snowmobiles include the Yamaha Venture, the Polaris Turbo, the Ski Doo Grand Touring Sport, and the Arctic Cat Panther and Arctic Cat Pantera. 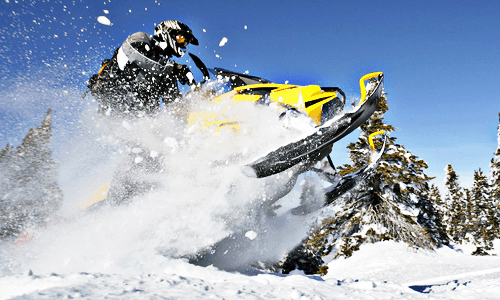 As the name suggests, mountain snowmobiles are designed specifically for riding in deep snow. Typically longer and narrower than other models, enabling them to climb both quicker and higher than heavier designs. Plus, their engines typically possess higher horsepower to perform well in higher altitudes, offering increased performance in tough vertical climbs when trail riding over rough terrain. Ski-Doo Summit 670, Yamaha Mountain Max, Arctic Cat Mountain Cat and Polaris RMK are popular models in this category. Typically focused on towing equipment in heavy snow conditions, these capable utility models offer heavier, longer and wider models than typical snowmobiles. Top-selling models of utility snowmobiles include Ski-Doo Tundra Xtreme, Yamaha RS Venture and the Arctic Cat Bearcat z X. This category is built for hard work, not for recreation. Purposefully designed for beginner snowmobile levels and young people—ages eight and up–youth snowmobiles feature lower horsepower levels, easier handling and controls including the ability to limit speed, enabling families to safely enjoy the winter season together. Popular models include: Arctic Cat ZR 120, Ski Doo Mini Z Base and Polaris 120 Pro-R.
Want Ad Digest features a wide range of classified ads for used snowmobiles for sale by owner, and we are adding new listings every day. Click here to find the used snowmobile for sale that is exactly right for you!